The most effective way to help our birds is to provide habitat as habitat loss is probably the most important factor in the decline of our songbirds (40% over the last 40 years). But we can’t all do something so substantial, but we can easily and simply provide some of our birds with food or housing. Here we will talk about housing; for feeding go to this page. Now, not all birds use birdhouses, but there are dozens of species that do. While some birds build nests on tree branches, shrubs, porches, and gutters, others seek an enclosure of sorts. These “cavity nesters” look for or, in the case of woodpeckers, create holes in wood to build nests and lay eggs. Unfortunately, there aren’t enough holes to go around. That’s where birdhouses (also known as nest boxes) come in. They provide valuable homes for many species of birds and a wonderful opportunity for birdwatchers to enjoy the age-old process of reproduction. Here’s what you need to know about birdhouses. Among the birds that like a roof over their heads are bluebirds, chickadees, woodpeckers, eastern screech and barred owls, wrens, and nuthatches. Different birds prefer different sizes of the hole (or opening) as well as how high that hole is from the birdhouse floor. If you live in the city or a populated suburb, you’ll most likely want a hole no bigger than 1 1/4”, which is big enough for chickadees and wrens but too small for house sparrows. House sparrows are an invasive, non-native species that can be detrimental to bluebirds, chickadees, and the like. Download our handy chart for more details. h online and you can find birdhouses in all shapes, sizes, and colors, and made of all sorts of materials. Birdhouses should be made of wood. Not only is wood durable, but it’s porous enough to allow moisture and heat to escape during the summer, which keeps the young birds from getting too hot inside. Metal and plastic can get too hot, which can cause harm to the birds. Do resist the urge to get creative. Birds avoid bright, unnatural colors (too obvious to predators). Instead, use natural, unpainted wood and stain the outside with a natural wood preservative such as linseed oil. Lastly, stay away from any birdhouse with a perch. Birds don’t need them and they only make it easier for predators or unwanted birds to get in. The best time to put up a new birdhouse is in the fall or winter so that birds will have plenty of time to locate them before the breeding season. What type of bird you want to attract will determine where you place a birdhouse. For example, bluebirds will use houses in open fields; chickadees, titmice, and nuthatches all like the open woods and edges; woodpeckers like forest openings and edges, and so on. For more details, download our nesting chart. The type of bird may also determine whether you place your birdhouse on a pole or up in a tree. Nuthatches and woodpeckers prefer the latter. Regardless, always mount the house with the entrance hole facing slightly downward to keep wind and rain from entering. And make sure it’s secured so that it does not swing or move. Before you put up birdhouses all over your backyard, keep in mind that a general rule is to place no more than two houses per species per acre of property. Thanks to Massachusetts Audubon for the above information. 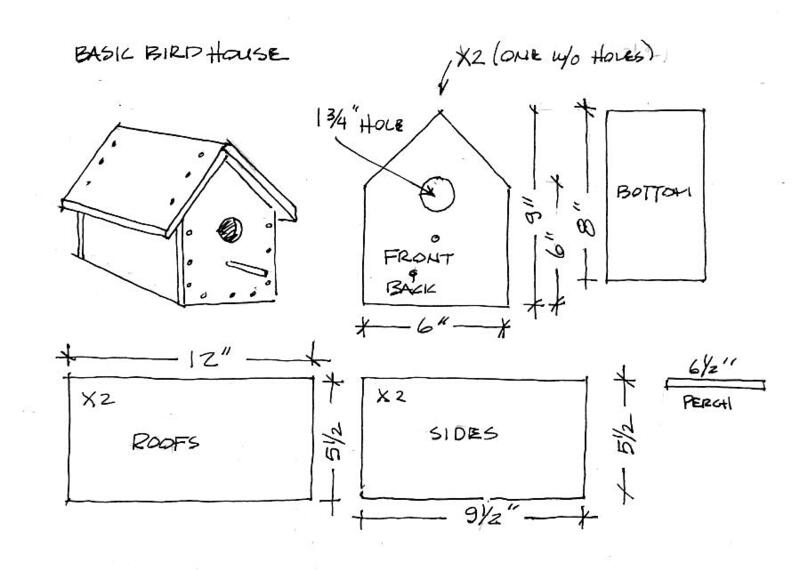 For a birdhouse and nesting chart, click here.